Defence lawyers have said Siti Aisyah and Huong were duped into thinking they were playing a prank for a reality TV show. Kuala Lumpur: A North Korean embassy official and a manager of Air Koryo, the national airline, met suspects wanted for the killing of Kim Jong Nam shortly after the murder, according to video recordings shown at the trial in Kuala Lumpur on Monday. 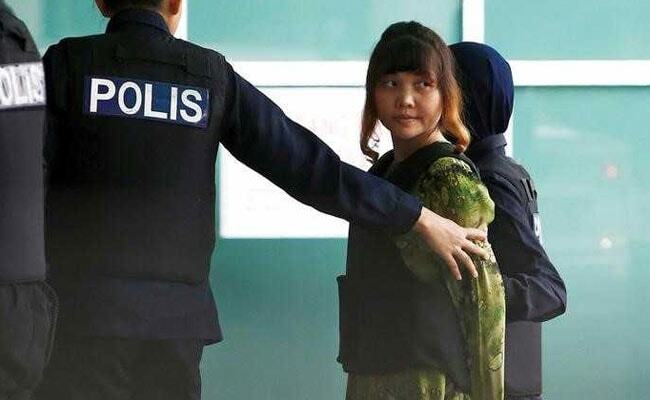 Two women, Indonesian Siti Aisyah and Doan Thi Huong from Vietnam, and four men who are still at large, have been charged in the murder of the half-brother of the country's leader, using banned chemical weapon VX at Kuala Lumpur airport on Feb. 13. North Korea has vehemently denied accusations by South Korean and U.S. officials that Kim Jong Un's regime was behind the killing. Kim Jong Nam, who was living in exile in Macau, had criticized his family's dynastic rule of North Korea and his brother had issued a standing order for his execution, some South Korean lawmakers have said. "They explained that the reason they were there was to assist every North Korean individual or citizen who boarded a flight to leave the country," he told the court. The North Korean embassy in Kuala Lumpur did not respond to Reuters' telephone calls and emails to seek comment. The sensational murder unravelled once-close ties between Malaysia and North Korea. Malaysia was forced to return Kim Jong Nam's body and allow the return home of three North Korean men wanted for questioning and hiding in the Kuala Lumpur embassy, in exchange for the release of nine Malaysians stuck in Pyongyang. Wan Azirul said police intelligence also provided information on a fifth suspect identified as Ri Ji U, who was also "suspected to have the real name James", based on images and photographs taken from Siti Aisyah's phone.